One of the things we do a lot of at 365 things to do in Kitchener Waterloo is drink coffee. The other is hanging around. It’s likely no surprise that a favorite place for both is Williams Coffee Pub. 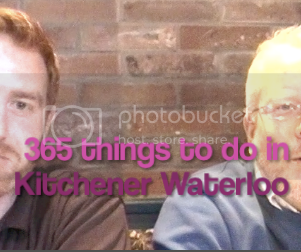 In the opinion of 365-kw, hanging around, drinking coffee is certainly doing something and that makes it one of the 365 things to do in Kitchener Waterloo. I love this page, but Williams? Really? We have 2 independent cafes (yes, locally owned and not franchised) that have world class baristas who own operate and work the bean. On top of that there are about a dozen other similar businesses that don't report having similar rockstar skills, but certainly have a coffee that doesn't taste like swill, or is chain owned! Or even a place that doesn't serve microwaved eggs (for the love of god, why?!) with their breakfast... Good ole Jimmy's Lunch can rock harder by actually making an egg on a grill. They also (and here is the clincher for many) hand cut their bacon. What about local focus on stuff like this too? This site is brilliant for knowledge about what's going on, but also, local focus on where we really do rock (and in coffee? heck, we are can't be beat by any other city around us, with the closest competition being 2 or 3 cafes in Toronto, and Montreal/New York, with those not necessarily exceeding us, but mostly in the same field of competition). I really like the passion of this comment. Thanks Terre for sharing. I drink a lot (a whole lot) of coffee. Please tell me the names of those independent cafes. We would certainly visit (and then write nice things about them). Did you know that Williams is a KW success story? 100% Canadian owned and operated, our first location was opened in Stratford but the company was based in KW for years before head office moved to Brantford. We have grown over the years to 34 locations most of which are owned by a local independent operator with a huge passion for their business, their community and the customers they serve! Thanks for recommending us on your 365 things to do! I knew that, well some of it.